This awesome bag has it all! The RPET Fold-Away Carry All bag is a 190D recycled post-consumer PET bag. This product features a sewn-in 4" x 5" pouch with rope closure and is up to 60% reusable/recyclable. Select this ecofriendly product as your next giveaway and feature it during company fundraising, recycling or charity events. 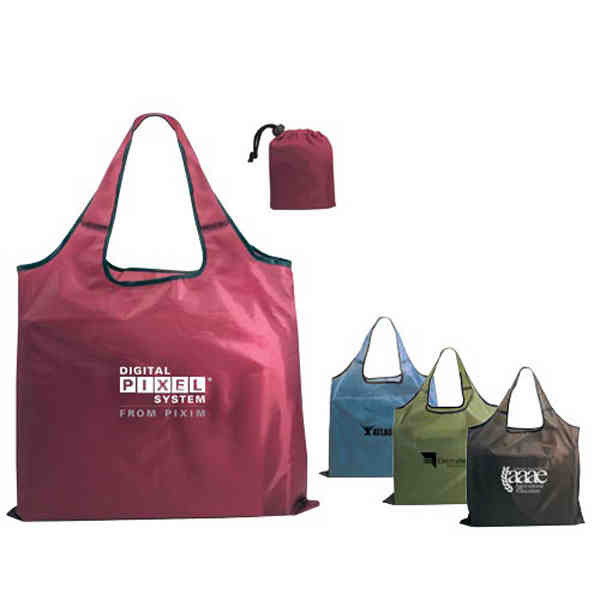 This bag is a wonderful way to promote your business during any time of the year. Be sure to get yours today. Size: 19 " x 15 1/2 "
Price Includes:One color silk-screened imprint on one side. Price Includes: Must be at least 1/2 the lowest quantity offered. Charge for ink change. Must be at least 1/2 the lowest quantity offered. Price Includes: Cannot guarantee exact match on colored surfaces. Charge for ink color match. Cannot guarantee exact match on colored surfaces. Change Copy. Must be at least 1/2 of the lowest quantity offered.